Destination Texas: Disruptive education as a means for student agency and inclusivity? Students have a sense of agency when they feel in control of things that happen around them; when they feel that they can influence events. This is an important sense for learners to develop. They need to be active participants in their learning. Like many teachers, I believed I worked hard to be innovative in my teaching and to connect with my students as individuals. As an English teacher, I used engaging texts and created impressive resources for novel ways of learning. I reassured myself that I was meeting their individual needs through differentiated learning activities and by giving them choice in what they were learning. But then there were the NCEA assessments — internal and external — I knew they were driving most of what we did. Isn’t that the definition of senior secondary school? Twenty years of teaching experience had led me to believe so. My students achieved really well in NCEA so did anything really need to change? I took a number of years to complete my MEd while teaching full-time and the more I read, the more I felt disillusioned by traditional forms of teaching. I kept looking for ways to meet individual student needs, engage my priority learners, and put students at the centre of their learning. However, I felt like there were limits in what I could change as a teacher — even as the head of a large English department. Where would I start with more systemic changes; what could it look like anyway? During a period of maternity leave, I took the opportunity to teach at a small primary/intermediate school for a year, and I experienced a less traditional approach to learning. This was a school where they had the freedom to design their own curriculum. They designed a way of learning, which truly put students at the centre, and individualised students’ learning programmes. I met many students who had not fitted into traditional school structures. They had felt largely ignored because they did not fit the mould. At this school, I was able to experience a pedagogical design that valued children as individuals who learn in different ways and at different paces. With an MEd under my belt in leadership and mentoring, I exited full-time teaching and took a position at CORE Education as an Accredited Facilitator, uChoose Mentor, and Expert Partner. Here, I found myself working alongside many other educators in various contexts, who were grappling with the same issues. 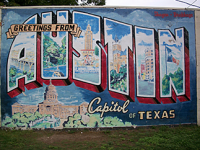 This new role at CORE Education afforded me the opportunity to explore further alternatives to traditional education by travelling to Austin, Texas in October 2017. I planned to visit schools who advertised themselves as offering ‘disruptive’ education, individualised learning, or high academic achievement. I wanted to know what they were doing and how. 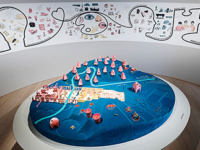 More importantly, what could we learn from their experiences for a bicultural New Zealand? What could the ‘ordinary’ teacher in a traditional school do differently? designed their physical environments to suit their approach to pedagogy and learning. I had watched the film, Most Likely to Succeed, so I was hoping to be inspired by a High Tech High disruptive model for learning. I knew what token attempts at student-centred learning looked like, but what does it look like when it’s more than tokenism? I had high hopes. So, where was I planning to go? Four schools welcomed my visit. Two can be grouped under the ‘disruptive’ education label: KoSchool (Middle and High School) and Acton Academy (Elementary, Middle and High School). * They are both private schools offering an alternative entrepreneurial approach to education through the use of Socratic discussions. Magnolia Montessori for All differs in that it is a public Elementary School created to address the achievement inequities experienced by some children. The last school is a selective public magnet high school for liberal arts, science, and mathematics — LASA East Austin, which boasts outstanding academic results. KoSchool is a private middle and high school of approximately 60 students who are taught in multi-level groups. This school is described as providing education for the next generation of thinkers, creators, leaders. This following video gives a good overview of their pedagogy — Ko School Incubator video (7 minutes). 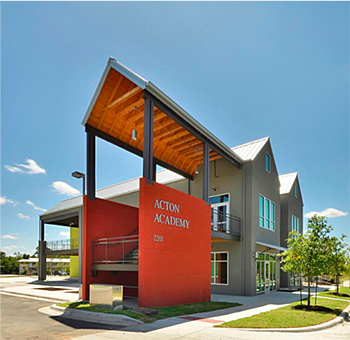 Acton Academy in Austin is one of several, internationally. Like KoSchool, Acton Academy is a private school, but for approximately 90 elementary, middle, and high school students. They also teach in multi-level classes and describe themselves as offering a revolutionary learning experience. Their mission is to inspire each child and parent who enters their doors to find a calling that will change the world. The following video discusses the origins of Acton Academy and the premise of their pedagogy — Rethinking Education: Geniuses and Heroes (19 minutes). 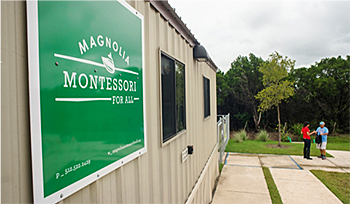 The Magnolia Montessori For All, which serves approximately 380 pre-kindergarten and elementary students is one of the few public (charter) Montessori schools in America. This video — Start Up! (2 minutes) — shows the beginnings of the school in pictures. This video — Austin’s First Public Montessori Opening in East Austin (2 minutes) — shows the launch of the school in East Austin. It opened in 2014 and its mission is to cultivate tomorrow’s leaders through inclusive practice. Montessori For All endeavours to open and lead free, high-performing, authentic Montessori schools that partner with families to help children in diverse communities reach their extraordinary potential intellectually, emotionally, socially, creatively, and physically, so that they can pursue lives full of meaning and joy. a 100% differentiated curriculum, which means that every child works at their own level in every subject. [IMAGE LSA-East Austin] The Liberal Arts and Science Academy (LASA) is a four-year public advanced academic magnet high school of 1,191 students. It was launched in 2002 as an amalgamation of The LBJ Science Academy and The Liberal Arts Academy at Johnston High School. 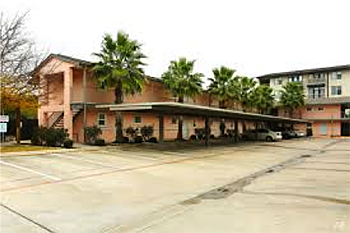 It boasts exceptionally high student achievement, ranking in the top 10% of schools in America by recruiting, “the most academically advanced students from public and private middle schools in Austin”. Their goal is to nurture innovation and curiosity. This video — The LASA video (6 minutes) — summarises the LASA experience from students’ perspectives. The Liberal Arts and Science Academy cultivates responsible leaders, problem solvers, and thinkers by offering a nationally recognized, rigorous, innovative, evolving curriculum. The School stands at the forefront of the nationwide effort to produce graduates with exceptional knowledge and skills in English, other languages, mathematics, science, social studies and technology. An outstanding high school education at the Liberal Arts and Science Academy of Austin (LASA) prepares students for higher education and at the same time encourages them to make a significant contribution to community, state and nation. RIGOR: The curriculum for every course — Math, English, Science, Social Studies, and Art- is written to go above and beyond state and district standards. COMMUNITY: Students take courses with teachers who are experts in their field and attend classes with students who enjoy the challenge provided by those teachers. INQUIRY: Many of our courses rely heavily on discussion and seminar style delivery of the course information. Other courses rely heavily on the use, interpretation, and delivery of research. EXCELLENCE: Teachers, students, and parents recognize that these four years are extremely important. Discussions of college selection, admissions, scholarships, letters of recommendation, and financial aid enter into conversations in the classroom beginning the freshman year. With research into each school complete and my bags packed, I set off with great expectation and anticipation. With each of the contacts I established with the four schools, New Zealand’s reputation for having one of the top education systems in the world proceeded me. As a practitioner within our system, I could see room for improvement and I hoped that I might find a few answers. I was planning to look for these answers in a fascinating place — Austin, Texas. It certainly is an interesting place to visit. The racial tensions of the ‘past’ are palatable in the present. Suburbs seem clearly delineated for different cultural groups, and religion plays a strong role in regulating society. I was keen to see how some schools attempted to address these tensions. In my next blog post, Student agency and inclusivity: 4 Texan schools, I look at what I discovered at each of these schools, and I explore the key themes which emerged. 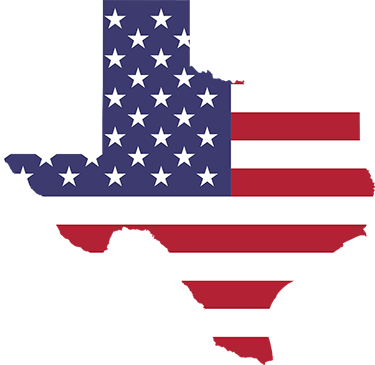 This second blog is followed by a third, Texan approaches to learning — NZ applications, where I look at New Zealand applications from the learnings I took away from my experiences. Look out for my next blogpost soon. * Elementary school is kindergarten through 5th grade (ages 5-10), middle school is grades 6-8 (ages 11-13), and high school is grades 9-12 (ages 14-18). All other images by the author. Amira Aman is an Accredited Facilitator (English-medium) and Expert Partner at CORE Education. She is a uChoose facilitator, working online and face-to-face with individual teachers and groups of teachers who wish to grow professionally. 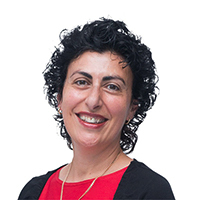 Amira has a sound understanding of the conditions which best support teacher learning and how teachers and leaders can develop their mentoring skills. Previously, Amira worked in Christchurch secondary schools, primarily Christchurch Girls’ High School, for twelve years, as Head of English.